"We believe that when people understand the reason for a task, it establishes motivation and becomes a force that keeps them persevering. As we think about teaching each one of the Daily Five, we start with explicitly explaining why" - Gail Boushey;Joan Moser. The Daily Five (p. xxxii). Kindle Edition. 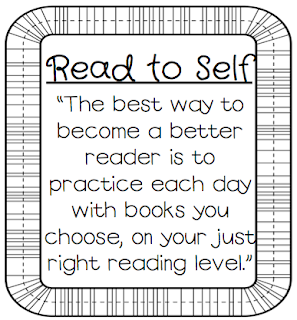 "Children need to know that researches say reading each day is the best way to become a better reader and that the best readers practice each day with books they choose." - Gail Boushey;Joan Moser. The Daily Five (p. xxxii). Kindle Edition. Things are so much more meaningful when you know why your doing them and how it is helping you. 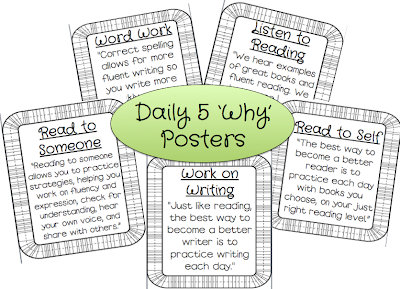 Since I want my students to know why we are doing the elements of the Daily 5, I created these posters to hang next to our Daily 5 i-charts. I'll go over each one when that aspect of the Daily 5 is introduced. I'm hoping this will help keep a sense of urgency throughout the year and will help my students & I stay focused on why we are doing what we are doing as well as the importance of it. Plus lets say administration or any other visitor come in to observe my class, they will know exactly why we are doing the Daily 5 (if they read the posters). I'm loving the idea of keeping why our work is important written right on our walls. My Daily 5 i-charts will be colorful so in order to not overwhelm the i-charts I made these in black and white. Plus it will save on ink too! Amber! Thank you so much for sharing..this is great!! I definitely need reminders as I'm very scared to jump into daily5 but feel it's the best step for my students!! I love the Daily 5! I'm rereading the CAFE book this summer for fresh inspiration. I love visiting your blog and have nominated you for The Versatile Blogger Award. Stop by to see! Thanks for sharing these for Daily 5! 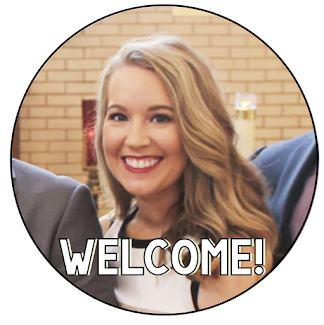 I am your newest follower and I just nominated you for two awards over at my blog! While you are stopping by, check out my giveaway! I'm your newest follower :) Thank you for sharing these D5 posters! Thanks for sharing these! I will be a first year second grade teacher this coming year and am so excited to be using the Daily 5! Thanks for sharing these why posters -- I think this will be particularly helpful!